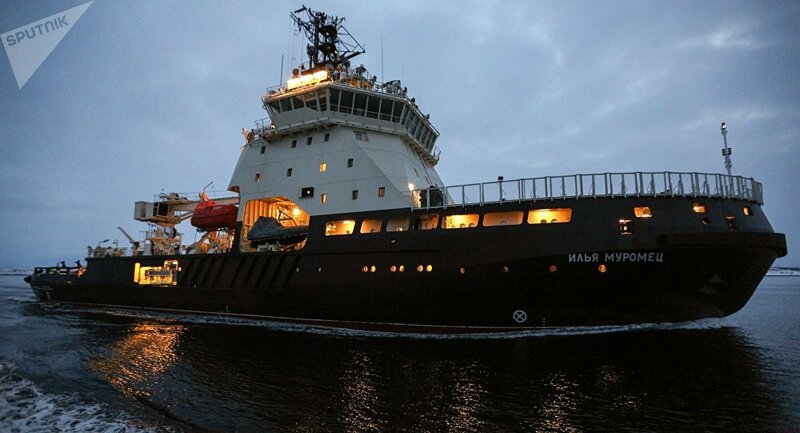 How will Russia’s last icebreaker help strengthen Russia’s positions in the Arctic? A military expert addressed the latest developments in Russian industry in this field. The sophisticated diesel-electric icebreaker Ilia Muromets is already part of the Russian fleet and is being tested on ice, in the eastern part of the Barents Sea. The tests – which will include an evaluation by the Russian Navy – are scheduled to last until the end of April, says Anatoli Saushkin in an article for Zvezda. One of the strengths of the icebreaker is its universality. The Ilia Muromets is capable of carrying out scientific, transport or rescue missions. Therefore, will be one of the main responsible for opening the way to ships and ships of the Northern Fleet of Russia. This vessel will play a very important role in the Arctic, a region whose importance has been underscored on more than one occasion by Russian President Vladimir Putin. “According to the estimates of the Russian Academy of Sciences, the Arctic contains an immense volume of world reserves [of natural resources], including 40% of gold, 60% of oil, 60-90% of gas, 90 % of chromium and manganese, 47% of platinum metals, 100% of kimberlite diamonds … The value of mineral raw materials in the region is about 30 trillion dollars, “said the Russian president. The article affirms that Russia is not willing to renounce the riches that belong to it by right, so it is creating in the Arctic a powerful ‘military fist’ that will watch over the defence of Russian interests in the region. To do this, the military that watches over the country’s northern borders is armed with the most sophisticated equipment and specialized equipment. For the moment, Russia is in a leadership position in the region, since it has the most extensive coastline and many years of experience in the Arctic. In addition, it has an icebreaker fleet and is the only country with nuclear icebreakers. However, the Ilia Muromets is not like other icebreakers -whose sole purpose is to open the way to other boats and perform scientific activities-, since it can carry out many tasks, also combat. The strong point of the ship is its propulsion system since it is equipped with four diesel generators with a total power of 10,600 kilowatts, which power its two engines. These engines are installed in separate columns outside the hull and its mechanism can rotate in any direction. Thanks to this special feature, the sophisticated icebreaker is able to move in any direction and perform quick maneuvers. In 2015, the Russian Ministry of Defense announced that in 2018 a “self-sufficient grouping” of Russian troops would be created in the Arctic. At present, aerodromes, closed cycle military bases and radar stations are being built. Guaranteeing the supply of all these groups will be one of the functions of the Ilia Muromets, and to fulfill this mission is provided with a cargo hold, cranes, space for transport containers on the deck and a heliport where helicopters can land Ka-32 and Ka-27. In addition, it can also transport troops, perform firefighting tasks and collect oil products in the event of a spill.